Opening doors to new markets in Russia, Turkey, Kyrgyzstan, Italy, Lithuania, and Austria for dozens of of Tajik companies; established contacts with important international retailers such as Auchan, IKEA, and Jeans-Makers; increased exports ; development of the textile and clothing export development strategy; organization of Tajik companies’ participation at international trade fairs in Paris, Shanghai, Moscow and Istanbul – these are just a few examples of the results of the implementation of the Trade Promotion Programme in Tajikistan over the past 3,5 years. In an interview with Mr. Saidmumin Kamolov, ITC Tajikistan National Programme Manager, some of the achievements and challenges of the project were discussed. Saidmumin Kamolov: “In the previous phase, the direct beneficiaries of the project were 15 exporting textile and clothing enterprises, representing about 30% of the sector, which received direct in-company assistance, as well as a larger group of companies that benefited from seminars and trainings. This does not mean that other actors in the sector were omitted. Our beneficiaries were also universities, two food testing laboratories, Trade Support Institutions (TSIs), including the local consulting companies, the Ministry of Economic Development and Trade, the Ministry of Energy and Industry, and SQAM bodies”. Saidmumin Kamolov: “I agree with this opinion and in our case the project’s approach of involving beneficiaries in its implementation ( for example, TSIs receive support while at the same time delivering assistance) played an important role in the project’s success, and should be a model for moving forward. The spread of knowledge to local consultants and especially to academia, will in the future act as a multiplier to other sector enterprises. The project methodology, in which a period of learning was followed by a period of practical implementation, is also considered as very successful. We actively collaborated with both policy makers and private sector representatives in preparing the sector export strategy. Using this opportunity I would especially like to mention the important role that our government partners played in the project’s implementation. Without the dedicated partnership with the Ministry of Economic Development and Trade and the Ministry of Energy and Industry, and their active support and participation, we would not be able to achieve all the results we are talking about today. 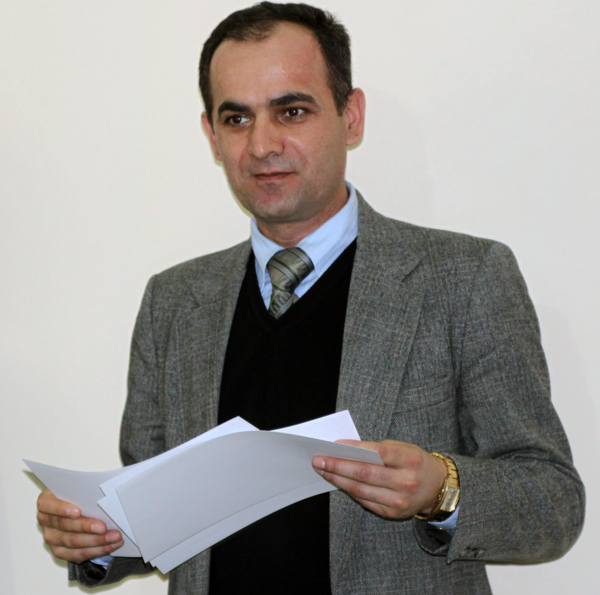 Our special thanks go to Mr. Saidrahmon Nazriev, Deputy Minister of Economic Development and Trade”. Saidmumin Kamolov: “Absolutely. In addition the assistance provided to the textile and clothing sector, I would also like to mention that thanks to project two Tajikstandart food testing laboratories were accredited according to ISO standard 17025, and the National Enquiry Ponits (NEPs) and the National Notification Authority (NNA) on TBT and SPS were established. I am also happy to highlight the development of specialized web-sites with online store features for our two pilot artisanal companies – “Suman” and “Haft Paykar”. The new websites allowed them to find new customers from Tajikistan and internationally. As the handicraft sector employs mostly women, , the increased number of orders means more job offers and income for Tajik women. Roughly 70% of the estimated eleven thousand employees in Tajikistan’s T&C sector are women. I am glad that our project made a significant contribution in maintaining and creating employment for women in Tajikistan. The assisted companies increased their workforce during the project period, and now employ around 4,000 employees, of whom 2,700 are women”. Categories: textile and clothing sector | Tags: textile and clothing sector | Permalink.